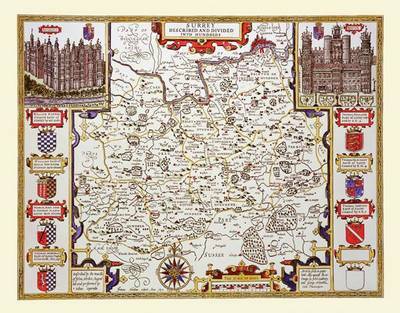 In the top corners of the map are superb illustrations of two of the palaces of the county - Richmond and Nonsuch. Beneath these, running down the sides are the armorial devices of the Dukes and Earls of Surrey, with the names of each Duke or Earl emblazoned in a banner above their coat of arms. The map shows the route of the River Thames (complete with boats!) which makes up the northern boundary of Surrey, and the city of London, before the inclusion of villages such as Brixton, Wimbledon and Clapham.